From Epipalaeolithic petroglyphs to Roman graffiti: Stylistic variability of anthropomorphs at Gebel el Silsila (Upper Egypt), International Conference "What Ever Happened to the People? Humans and Anthropomorphs in the Rock Art of Northern Africa. Returning to Gebel el Silsila: New discoveries of the Swedish Archaeological Project. The Gebel el Silsila survey project is an archaeological documentation and comprehensive survey of the ancient sandstone quarries at Gebel el Silsila (East and West) in Upper Egypt, including the area of Nag el Hammam under the patronage of LUND UNIVERSITY (Sweden), and under the supervision of Aswan General Director Mr. Nasr Salama, and Kom Ombo General Director Abd el Menum. BECOME PART OF OUR FRIENDS OF SILSILA FAMILY. During the spring season 2016, the team discovered a remarkable New Kingdom necropolis with archaeological material dating from the early 18th dynasty and indications of re-use throughout the 19th dynasty. So far, over 40 tombs have been documented, including a small shrine, many of which have suffered from heavy erosion and extreme decay due to the rising water table and its high salt contents. As part of exploring the best method to save the monuments, the team undertook the careful cleaning of a small selection of tombs, work that will continue during forthcoming seasons. The tombs consist of one to two undecorated rock-cut chambers, with one or more crypts cut into the bed rock floors, some preserved with remains of their original lid. The entrance of the tombs consist of a squared semi-dressed aperture that incorporate a vertical slot to either door jamb that would have facilitated a portcullis type of closure. The tombs are generally accessed via a series of steps that descend into a rough-cut squared chamber. Due to the lack of exterior or interior decoration, the identity of the persons buried remains unknown at this time. 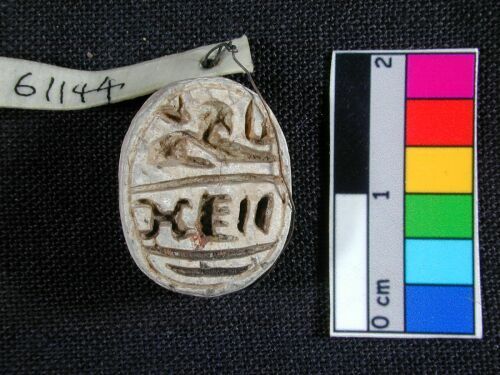 Among the more important findings was a reversible seal ring, which depicts the cartouche of Pharaoh Thuthmosis III “Men-kheper-re” (comparable with seal UC6114), and a scarab also bearing the pharaoh’s name. Associated text on the seal's reverse is currently studied by the team's Egyptologists. Six ancient Egyptian statues depicting a man named Neferkhewe, his wife Ruiurest and his family, have been discovered on the west bank of the Nile River, at Gebel el Silsila. The statues date back 3,500 years to Egypt's 18th Dynasty and were buried by an earthquake and Nile flooding sometime in the last 2,000 years. Statues of Neferkhewe, chief of the Medjay and overseer of foreign lands during the reign of Pharaoh Thutmose III and his family, were discovered by the Gebel el Silsila team in two cenotaphs, which are shrines or memorials to the dead, but the bodies are interred elsewhere. An earthquake sloughed this shrine off the bluff in ancient times, and repeated Silt from Nile flooding covered the site until archaeologists uncovered the statues in December 2015. Carvings flank the statues of an ancient Egyptian elite couple. Researchers are working to clean and translate more of the carvings found around the two new cenotaphs. These statues are the best-preserved of any of the 32 cenotaphs at the site, said excavation co-director John Ward. Large ears and round cheeks hint at the individual characteristics of the person being remembered. Archaeologists aren't sure why certain families chose to build cenotaphs, or shrines, at Gebel el Silsila, which is also the site of an enormous sandstone quarry that provided the rock for Egypt's buildings and temples for centuries. The lost temple of Kheny FOUND by Maria Nilsson, John Ward and the Silsila team! Remains of the long lost temple of Kheny have been unearthed by Swedish Mission Director, Maria Nilsson and Assistant Director, John Ward, at Gebel el Silsila, north of Aswan, Egypt’s Minister of Antiquities announced on Sunday, May 17, 2015. Revealing the foundations and blockwork of the temple, the ruins are one of the few remnants of the settlement of Kheny or Khenu, which is the ancient Egyptian name — meaning “Rowing Place” — for Gebel el-Silsila. Your support is vital in enabling the FRIENDS of SILSILA to fulfill its mission to share this ancient site and its treasures with the world. The Friends of Silsila relies on funding from a wide range of sources and there are many ways that you can donate to help ensure the continued archaeological work, guardianship, care and preservation of this ancient historic site for future generations. All donations are made in USD. Please check the conversion table below. © 2017 FRIENDS OF SILSILA. NO PART OF THIS SITE MAY BE REPRODUCED OR DUPLICATED WITHOUT EXPRESS PERMISSION.